Let's talk Christmas...specials. There are so many now, with more every year, but I love the older ones. None more so than Twas The Night Before Christmas. No one seems to remember this show but me anymore. Maybe it's my age, or maybe it wasn't that popular, but it will always have a special place in my heart. Mostly because of the mice in it. See that calendar? That's the Christmas calendar my mother bought my sister and I when we were little. See the little mouse? That little mouse was cause for some of the biggest fights in my childhood home. You see, we would take turns moving him everyday in December...and we always both wanted the even days, so we could have the last turn. It got so bad that my mother put a note in the 24 pocket each year for who had even numbers the next year, so the fighting would stop. My daughter now had the calendar to herself, unless my sister has a child. We have agreed when and if that happens we will trade it between us every year. 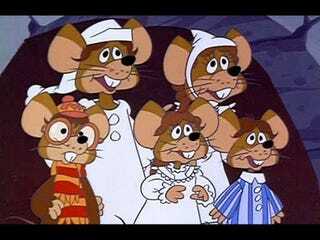 So anyway, Twas the Night Before Christmas having mice in it made it really special for my sister and I. What's you favorite Christmas-time show? And Happy Friday everyone! I hope you all have good weekends!